Tickets are now available for the Citizens Memorial Hospital/Citizens Memorial Health Care Foundation’s 14th annual Burgundy Ball. Former Arkansas governor, New York Times bestselling author and commentator, Mike Huckabee, will present “Too Funny To Be True, But It Is!” – hilarious stories from politics, the South, and travel. The community appreciation event is scheduled for Saturday, Sept. 16 at 6 p.m., at the University Plaza Convention Center, 333 S. John Q. Hammons Parkway, Springfield. Hundreds of people from Bolivar and the surrounding communities are expected to attend the event. Previous speakers have included Amy Purdy, Lee Ann Womack, Ken Schrader, Roy Firestone, Amy Grant, Henry Winkler, Kyle Petty, Vicki Lawrence, Sugar Ray Leonard, Carl Edwards, Ozzie Smith, and Anne Jillian. Proceeds from the event support programs and services for patients and their families at the Carrie J. Babb Cancer Center at CMH (CJBCC) including the Tremain Family Hospitality House, located across from CJBCC. For more information about the CMH Burgundy Ball, contact Wren Hall at 417-328-6318 or http://events.readysetauction.com/citizensmemorialhospital/BB2017 (readysetauction.com link no longer available). Mike Huckabee was the 44th governor of Arkansas from 1996 until 2007, becoming one of the longest serving governors in his state’s history, and was only the fourth Republican elected to any statewide office since Reconstruction, serving longer than the other three combined. He left a legacy of tax cuts, job creation, the reconstruction of his state’s road system, K-16 education reform, and a nationally heralded and duplicated health initiative that focused on prevention. Gov. 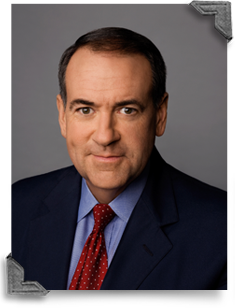 Huckabee was the host of the number one rated weekend show “HUCKABEE,” on the Fox News channel, from 2008 until 2015. He also hosted “The Huckabee Report” – which was heard three times daily across the nation on almost 600 radio stations from 2009 to 2015 – and is the New York Times bestselling author of 12 books. Governing magazine named him as one of its “Public Officials of the Year” for 2005, and Time magazine honored him as one of the five best governors in America. He has been honored by numerous organizations for his commitment to music education. He served as the chairman of the prestigious National Governors Association as well as the Education Commission of the States, the Southern Governors’ Association, and the Interstate Oil and Gas Commission. Huckabee, 61, an avid musician since age 11, is a bass player. His hobbies include hunting, fishing, and music. He was named one of the “25 Most Influential People” for Conservation by Outdoor Life magazine, and was named “Man of the Year” by the American Sportfishing Association in 1997. The former governor and his wife, Janet, live in Florida and still spend part of their time in Arkansas. They have three grown children – John Mark, David, and Sarah – and five grandchildren – Chandler Huckabee, Scarlett Sanders, Caroline Grace Huckabee, William Huckabee “Huck” Sanders, and George Sanders. CJBCC is staffed by Leo Shunyakov, M.D., board certified in medical oncology, hematology and internal medicine, and Abhishek Kumar, M.D., board certified in internal medicine, and board certified radiation oncologists Garry Brown, D.O., M.S., and Claudia Perez-Tamayo, M.D.